Scholastic Press, New York, 2015. 670 pages. Here is another book by Brian Selznick which mingles his detailed, fascinating pencil art with a written story. In this book, the art – at the front and the back – tells a separate story from the written story in the middle of the book. There is a twist as to how the two are related. The pictures in the art go back to a shipwreck that happened in 1776 to a boy named Billy Marvel, then continue to a theater in London, where the Marvel family became actors for generations. But one boy didn’t belong in the theater like the rest of his family. The written part of the story also takes us to London, in 1990, to a boy running away from boarding school and looking for his uncle. His uncle lives in a house elaborately furnished as if a Victorian family still lives there. And there are hints of the Marvel family all over the house. I am not necessarily the best audience for Brian Selznick’s work. I found that, as with his other books, I wasn’t quite drawn in to the story. Maybe because I’m not used to getting my stories through art? Maybe children more accustomed to graphic novels will enjoy it more? Whatever the reason, I can and do still appreciate Brian Selznick’s craftsmanship. His art is detailed and exquisite. As for the story, it seemed a little melodramatic at first – but then he revealed a reason for that. I did appreciate the way he tied the two stories together in a way I hadn’t seen coming. He also tied the book to an actual house in London in the Author’s Note in a way that added poignancy to the story. Brian Selznick’s books tend to have an alienated boy character who uncovers a mystery and works to solve it with the help of a friend and maybe in spite of curmudgeonly grown-ups. I’m not quite sure why I don’t seem to naturally respond to these characters, but I can easily imagine kids who would. This is also a beautiful book. Besides the detailed artwork, the page edges are trimmed with gold and there are golden decorations on the front cover. It’s a big fat book which is also a quick read, because the majority of the story is told through pictures. Definitely give this to kids who have enjoyed The Invention of Hugo Cabret and Wonderstruck. 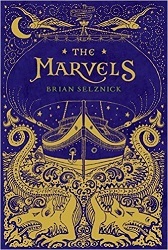 Each of the books is a completely separate story, though, so perhaps The Marvels will win Brian Selznick some new fans. This entry was posted on Tuesday, June 7th, 2016 at 10:53 pm and is filed under Children's Fiction Review, Historical. You can follow any responses to this entry through the RSS 2.0 feed. You can leave a response, or trackback from your own site.